52680-RB is rated 4.7 out of 5 by 10. Rated 5 out of 5 by Sparkie from Touch-Clean Technology and Warranty are Great! This is a great shower head for our guest bathroom. We love the wide shower head and finish. The water at our cottage is hard, so the Touch-Clean Technology was an important factor in our choice of this shower head. The fact that Delta offers a lifetime warranty was also of key importance to us. 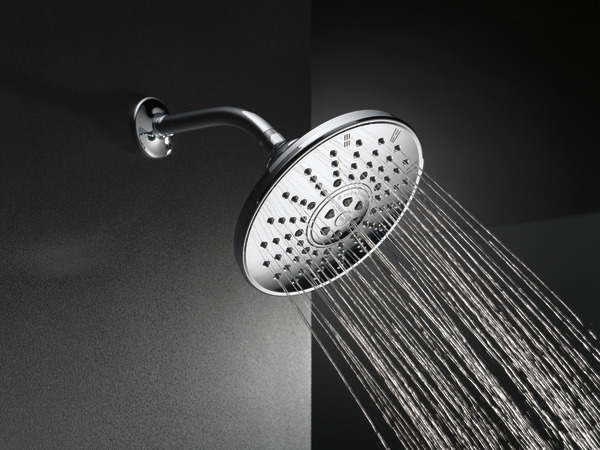 We want low maintenance, handsome features, and high reliability, and I feel we have it in this shower head. A great choice for us. 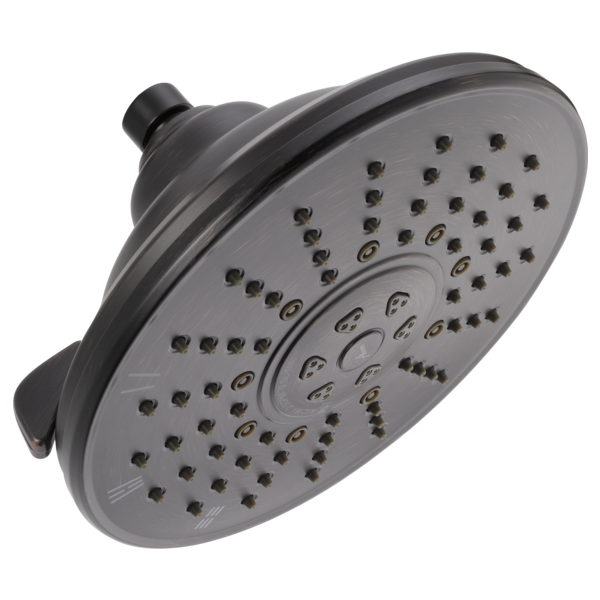 Rated 5 out of 5 by Big Rich from One of the best almost rain shower heads available I am really happy with this product. I am a big guy and this shower head pushes out a stream of water which totally engulfs me. Rated 5 out of 5 by Gman from Great shower This shower head is just what we wanted...a large look, wide spray, more forceful spray when you want it. No leaks or issues. Rated 5 out of 5 by Doris from Great product I purchased this shower head when my existing one sprung a leak. Very easy to install and the water pressure is great. Also love the option to adjust the water jets and the amount of water that comes out is a significant from my last shower head. I have not noticed any increase in my water bill although I feel like I am using so much water. Would recommend to anyone looking to remodel or upgrade their bathroom. Rated 5 out of 5 by Bakerchik from Love it! Received my shower head 2 day after I placed the order. Super fast shipping and excellent product! Rated 5 out of 5 by a91stella from Perfect Received item. Wrapped securely. Has great coverage and not a whimpy water flow. I ordered this for our master bathroom suite remodel. Perfect addition. My husband loves the different shower head options. Rated 5 out of 5 by Rbeasley3 from Great shower head! My husband loves this showerhead especially the multi function! Rated 2 out of 5 by Rich48 from Pulsing water flow We just completed remodeling our master bathroom in December 2016. During our first use of the new Delta shower we noticed pulsing sensation in the water flow through the spray setting. It's a random short break in the water spray which results into a pulsing sensation. Delta customer service at no charge to us sent a new replacement shower head but the end result is the same pulsing sensation. Replacing this Delta shower head with a inexpensive hardware version shower head verified that the pulsing sensation is caused by the Delta product. The 3 settings work well except with the exception of the pulsing spray setting. Delta customer service is top notch I have no complaints but this particular product has an apparent design flaw therefore I cannot recommend this Delta Raincan 3-Setting Touch-Clean Shower Head especially at the cost of this product. how would this shower head be installed from the ceiling? What part would I need to purchase? What is the diameter, in inches, across the face of the showerhead? The dimensions as listed on your website are 8-5/32 in. H x 4-11/16 in. D x 8-5/32 in. W. I assume the width measurement is actually the diameter but there is no way this shower head is 8+&quot; high and wide unless you stand it so the joint where water comes in to the showerhead is parallel to the surface it's on. Does this showerhead swivel on the arm? and does it come with the arm? What shower arm would you recommend for this shower head? My husband would like to replace our Chrome finish Delta 14 Series fixtures with Bronze finish. We currently have a spray shower, but would like to replace with this shower head. We will need to buy both a shower arm/flange in addition to the shower head. What arm would you suggest for ease of install and best performance with this particular shower head? 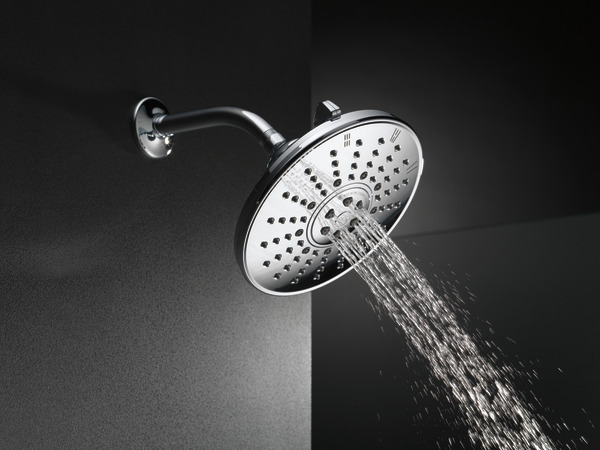 Will Model # RP6023 work and does the shower head itself tilt or is it fixed on the arm? Thank you! Will the RP46870 16&quot; shower arm work with this head? Being so so large, will this nozzle still produce a strong forward shooting spray? What do the three settings do? 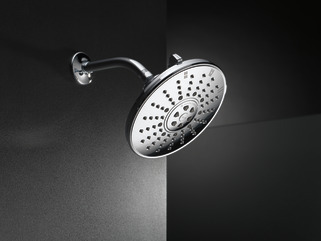 I am looking for a Delta Venetian Bronze shower head to go with my new T17T097-RB shower valve. I want a 6&quot; or bigger diameter head but also want a decent forward spray while using the built-in water constrictor (if possible). Thank you for your question. Delta Faucet model # 52680-RB has a water flow of 2.5 gpm at 80 psi. There are 3 settings to the 8&quot; spray face. They are Massage spray, Full spray w/massage, and Full body spray. We recently purchased this shower head and noticed the massage/stream combo setting does not work on our shower head. 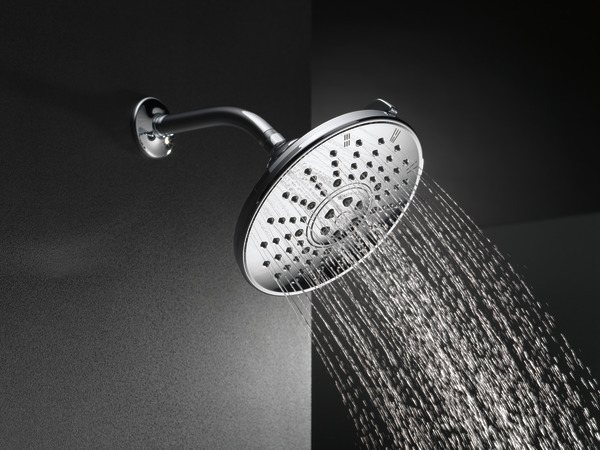 Is there something we need to change in our installation, or do we need to return for a new shower head? Hello! I have the Delta 142710-SS unit in our new master shower. We have been advised to swap the arm and shower head due to the water shooting on our new shower doors. We want to try to eliminate the amount of water hitting it. Can we switch the arm out to RP61273-SS? And put shower head 52680 or 52687 on the new arm? Can we do this with the existing model we have (142710) and will either of those shower heads work with the new arm size? Please advise...many kind thanks! !